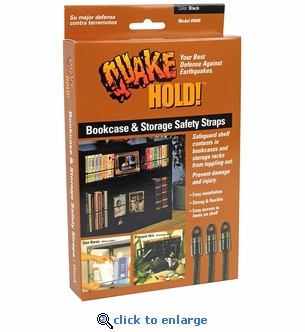 Use Quake hold Bookcase & Storage Straps to secure books, supplies and other items that are stored on open shelving units in the event of an earthquake. Prevents items from falling, blocking exits or landing on family members or employees. One kit will secure three shelves up to 4 ft. in length. Easy to set up; Cut to desired length then simply slide the cord into one end-cap connector and snap together. Repeat on other end of cording and then fasten to the edge of shelf. These storage straps make an excellent earthquake preparedness solution for homes, garages, offices, RVs and boats. Adjustable length up to 4 ft. Allows easy access to items on shelves. 9' of flexible shock cord.